If you haven’t already, I recommend you read Part 1 and Part 2 of this series for the first two pieces of advice given to me by Dave Ramsey during a town hall meeting. In this third and final article in the series, we’re going to break from the marketing angle of the first two posts and focus on something that is especially pertinent in these economic times. This principle is classic Dave Ramsey, but incredibly valuable none-the-less. The “Sharon” Fund is basically an emergency fund of retained earnings for the business named for his fiscally conservative wife, Sharon. The principle is a simple – set aside a percentage of your profit in an account that can be used in emergency situations to cover planned or unplanned expenses such as payroll or rent. Ideally, this fund will be enough to get the company through a number of months (I’d say closer to a year) should things turn dramatically against your business. The best part of having an emergency fund? You don’t owe anybody anything when you use it. There are no monthly interest charges, no collection calls, and you’re debt-free when your industry turns around. Working in the technology industry, I see this principle violated on a daily basis where companies are built on debt. They live and die by the almighty “burn rate” (the rate at which they burn through cash either invested in, or loaned to, the company). I can’t tell you how many industry blogs and articles I’ve read lately warning technology start-ups of the coming credit and investment crunch. Why? Because insiders know many of these companies have tiny revenue (if any), large payrolls and a business model built on a buyout. Investors are realizing that, in this market, those companies will need to survive longer than originally estimated, yet don’t have the inherent model to do so. Lisa and I have done this personally and we’re going to apply it to our business. I can tell you from personal experience that our emergency fund has kept us from charging up a credit card for things like auto repairs, medical bills, etc. When we use our emergency fund, it’s the first account to get paid back until it’s restored to the amount we agreed on – no questions asked. 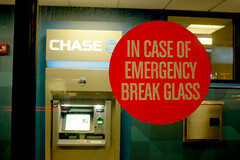 Do you have an emergency fund in your personal or business finances? What has been your experience with them? If you don’t have one setup, is there are particular reason? Does something work better for you? Leave a comment below and tell me about your experiences with emergency funds. For anyone that’s interested, here is a link to Dave Ramsey’s latest book. I highly recommend it.